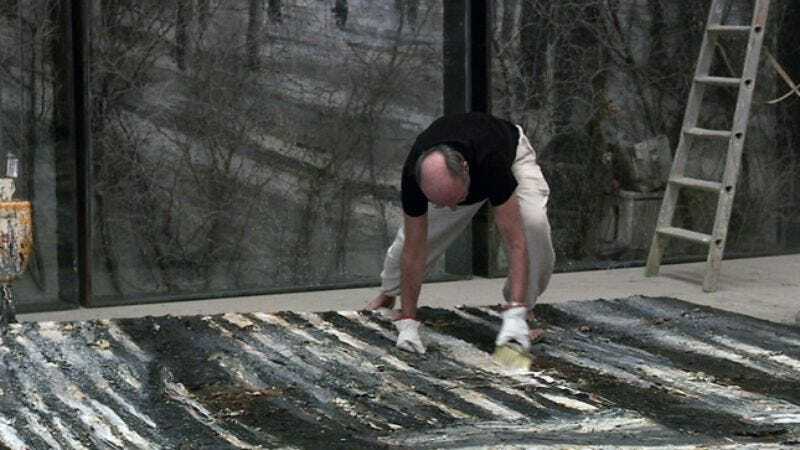 Sophie Fiennes’ latest documentary, Over Your Cities Grass Will Grow, profiles German artist Anselm Kiefer while determinedly refusing to provide any easy context for its subject by way of talking heads or interviews to the camera. Few biographical details are offered, beyond an opening card that explains that for the past decade, Kiefer has been building installations in and around a former silk factory in southern France. Over Your Cities Grass Will Grow attempts to let Kiefer’s art, and the process by which it’s made, speak for itself. There’s something admirable to this austerity and the way it insists viewers start by engaging with Kiefer’s large-scale constructions, wordless explorations of which bookend the film. It’s also a bit of a cheat—the doc, shot gorgeously on film, is itself a mediation between us and the art, capturing in another medium work that’s meant to be experienced in context. Kiefer’s creations are haunting, beautiful things that recall the remnants of a dead civilization left to be excavated and explored. Winding tunnels scattered with ceramic and glass shards are illuminated by uncovered bulbs and occasional light wells; the burnt husks of books fill a shelf; bed-shaped platforms labeled with names line a room that recalls an abandoned sanitarium; gutted, chair-like objects sit amid swells of earth inside the doorless shell of a building. Kiefer’s work is often interpreted as referencing the Holocaust and the era of Nazi rule, but that theme is left unexplored; when he does speak about his work, in an interview with a journalist at the film’s midpoint, the talk is more abstract, ranging from the quality of light in the region to Heidegger’s thoughts on boredom. Fiennes doesn’t seem interested in providing a bridge for new audiences to understand her subject—her last film, Slavoj Žižek’s lecture The Pervert’s Guide To Cinema, was broader and more entertaining, but similarly unapologetic. And why should she apologize? Films bear no inherent obligation to educate. But when Over Your Cities Grass Will Grow moves away from observing the art, from the camera gliding through Kiefer’s underground labyrinths or the stunning skyline of tottering towers he constructs at the film’s end, it grows numbing, a drone of gray-clad men working in front of gray backdrops on gray pieces that will be much more interesting when complete.